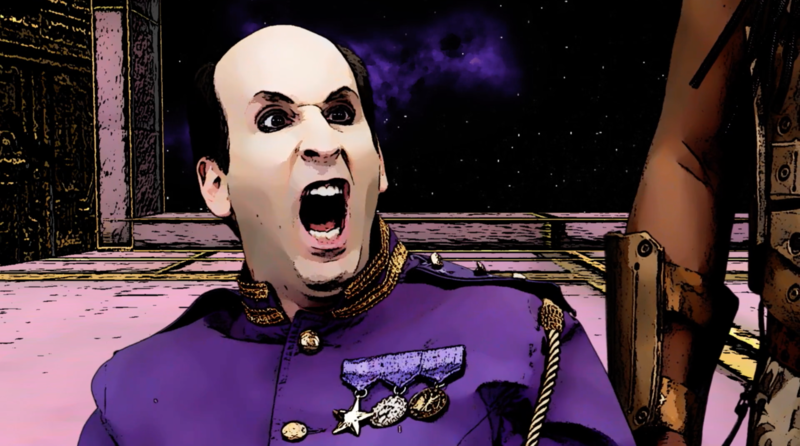 SYNOPSIS: GALACTIC GALAXY is an irreverent space saga filled with action, suspense, and a healthy dose of the absurd. It is the story of a Space Werewolf named Fen who teams up with a Space Trucker named Pam to rob an illegal space disco in order to fulfill his destiny and save the Galaxy. SYNOPSIS: Imagine a place for those who have passions for anything and everything geeky…whether it’s sci-fi, super heroes, gaming, mythology, technology, whatever it is, this is their safe haven. A place where geeks can go to drink, to laugh, to debate, to flirt, or just to be themselves. And despite their differences, and their disputes, the patrons here are a family–a dysfunctional family, but a family nonetheless. 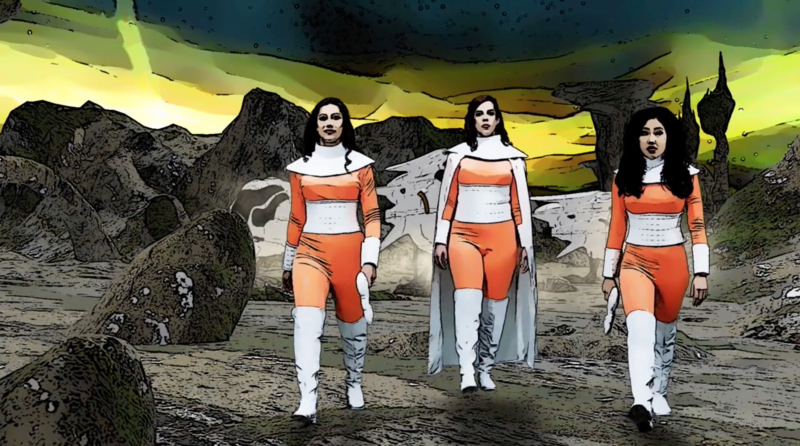 This is a comedy web series about geeks and for geeks. DIRECTOR’S / FILMMAKER’S BIO: Larry Zeigelman was born and raised in St. Louis, Missouri. He grew up on a steady diet of television, movies and comic books. Ever since childhood he couldn’t decide whether he wanted to be an artist or a doctor. So, he settled on advertising. SYNOPSIS: Dark, mysterious and visually captivating, “In Absentia” is an anthology series of contemporary, dark folk tales consisting of drama, science fiction, horror and a psychological thriller. The series focuses on characters confronted with the absence of both the material and intangible. 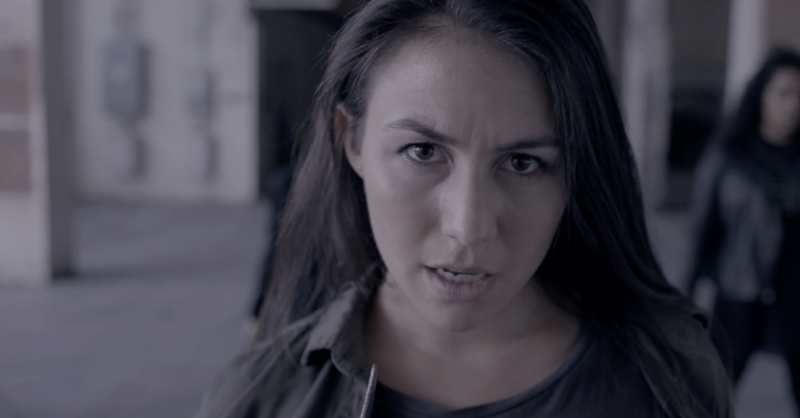 DIRECTOR’S / FILMMAKER’S BIO: Jessica Silvetti (NYU Tisch) and Ethan Kogan (Univ. of Michigan, RADA) have been writing and directing together for several years. They both have very strong backgrounds in theater, both spending a significant amount of time in the Los Angeles based company, The Actors’ Gang. In their first feature film, PROBLEM OF EVIL, 2014, they led a tremendously talented cast into a production where the entire script was dramatically improvised with stellar results. They have gone on to write and direct numerous short films with successful festival runs including, POOR MAN’S MERMAID (2015), for which they won the Remi Award at the WorldFest Houston International Film festival. SYNOPSIS: Gabrielle, a single thirty year old woman, doesn’t understand men and is never able to have a long relationship. Unable to communicate with them, she is sent by a colleague to a kinesiologist who promises her that she will develop a power: she will be able to completely understand someone close to her. And what if this man was actually her best friend and roommate that is now subtitled? 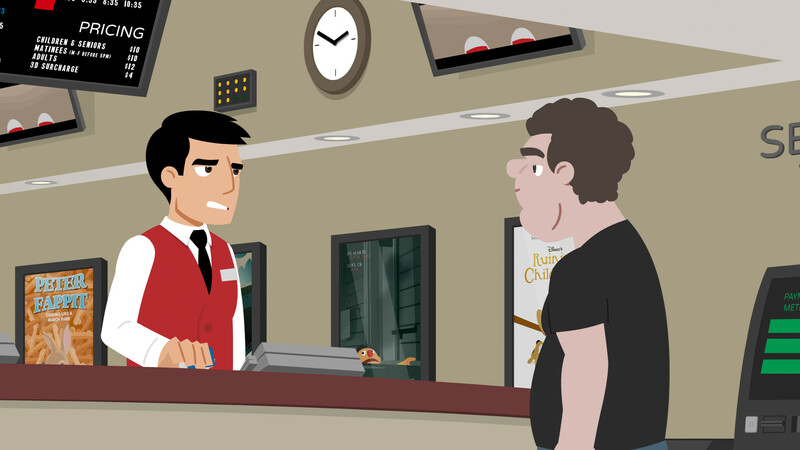 SYNOPSIS: A grumpy movie theater employee gets a lesson in customer service from a co-worker. DIRECTOR’S / FILMMAKER’S BIO: Gordon McAlpin is a freelance writer, cartoonist, illustrator, designer, and animator. He has an MFA in Design from the University of Minnesota–Twin Cities. He lives in Somerville, MA, with his fiancée Karyn and their cats, Dipper and Mabel. SYNOPSIS: A group of mysterious men track down an estranged Kansas man and find themselves in the path of an extra-terrestrial visitor. DIRECTOR’S / FILMMAKER’S BIO: Eric Hyde, born in Lawrence, Kansas on October 14, 1985, began his love for film in the 90’s with cable TV and movie channels. He grew up around mechanics, photographers, musicians, and outdoorsmen. His first theatrical viewing, at the age of 6, was Terminator 2. Soon after, his mother took him to the local VHS store and purchased a used copy of Indiana Jones and the Last Crusade. And not long after that, he fell in love with the movie Predator. DIRECTOR’S / FILMMAKER’S BIO: Michael Krehan, born in Germany but living in California since 2002, has been in the video games industry for almost two decades, working on titles such as “Red Dead Redemption” and “Grand Theft Auto V”. He had a keen interest in filmmaking ever since his teenage years. He started with little film experiments and volunteered on various film sets as boom operator, camera assistant, and editor, until he decided that the time was right to realize a project of his own and created “Apprecation”, which made the rounds through the festival circuit in 2015. SYNOPSIS: Swords, Songs & Slayers collide in this Musical Action Comedy that pits Megan and her team of vampire hunters against a sinister bloodsucking syndicate. DIRECTOR’S / FILMMAKER’S BIO: Crystal Arnette is the co-founder of non-profit arts initiative SEQUIN & the founder of the production collective Adventure We Can. Along with The Bats, she co-created SERIALS @ The Flea in 2010 and served as co-creative producer from 2014-16. She has created & directed video content for The Flea, Ars Nova, NYTW, Ensemble Studio Theatre, ECM Records, Atlantic Theater Co, The New Group, Playwrights Horizons, Shantell Martin, Geometry Global, Reuters, HSBC, Unilever, The Make It Fair Project + many more. Crystal was a member of The Bats, the acclaimed resident acting company at The Flea for 6 seasons. She has also performed with The Bushwick Starr, Atlantic Theater Co, Woolly Mammoth, W.H.A.T, The P.I.T., and Webster Hall. Crystal stars in the features What We’ve Become & You Can’t Kill Stephen King; the award-winning shorts Polaroid Girl and Requited; and can currently be seen in the hit web seres Unicornland. SYNOPSIS: Psychic heroes fight to stop an international terrorist from selling cigarettes to kids. DIRECTOR’S / FILMMAKER’S BIO: David Hiatt is a Calgary-based movie-obsessed man-child. That obsession began when he was 8 years-old and saw a behind-the-scenes special on Fox Kids for Mighty Morphin’ Power Rangers: The Movie (1995). He’s been making movies ever since. David graduated from SAIT’s Film and Video Production program in 2011, and later from the University of Calgary’s Bachelor of Film Studies program in 2015.